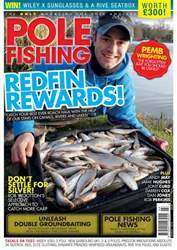 The May issue of Pole Fishing is jam-packed with all the tips, tricks and tactics needed to get you catching now that spring is here. 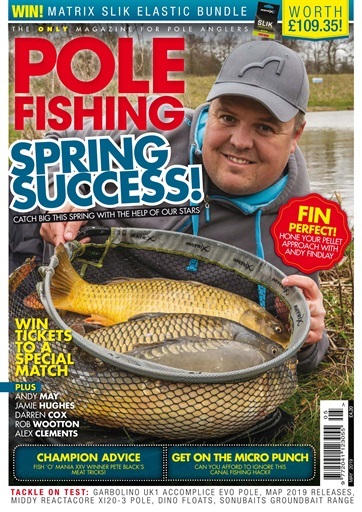 Cover star Jamie Hughes continues to reveal how and why he makes certain decisions in a match situation in his ongoing diary piece, exclusive to this magazine, while Andy May heads to the Oaks Lakes at Sessay, a venue he has had a lot of success in years gone by. Plus, we have the likes of Darren Cox, Rob Wootton and Alex Clements on hand, to name but a few. 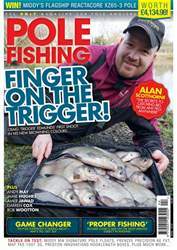 As always there is plenty of tackle on show too – Garbolino’s UK1 Accomplice Evo pole is taken for a spin by editor Jake Fowles, as is the mid-range Middy Reactacore XI20-2. 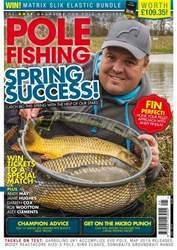 You can also get involved in two fantastic competitions, with a Matrix SLIK elastic bundle up for grabs along with two money-can’t-buy invitations to this year’s David Hall Trophy memorial match at the brilliant Glebe Fishery, where you could be rubbing shoulders with some of angling’s biggest stars.